In the first quarter of this year, GDP growth hit a record level of 9.9%, the fastest quarterly growth for six years. But growth fell back in the second quarter to only 6.7%, due to the 'severe acute respiratory syndrome' (SARS) epidemic negatively affecting in particular the services sector and certain regions, above all Beijing and the province of Guangdong, while some sectors of the economy such as real estate, steel, construction materials and automobiles continued to boom. Overall economic growth during the first half of the year came to 8.2%. In both quarters, the Chinese economy was supported by a rapid increase of investment and fast rising exports, while consumer demand was relatively weak in the first quarter already and further decelerated in the April to June period. 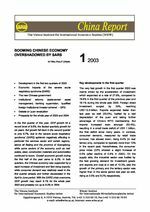 With the SARS crisis overcome, GDP growth may reach 8.1% for the whole year 2003 and probably run up to 8.3% in 2004. Keywords: China, GDP growth, investment, consumer demand, foreign trade, foreign direct investment, government, severe acute respiratory syndrome (SARS), state-owned assets, banking supervision, exchange rate.